MISSION IMPOSSBILE - FALLOUT from Parmount Pictures, directed and produced by Christopher McQuarrie is a home run, hands down. So much fun, that you grab your popcorn and hang on for dear life. This is now officially one of the greatest action spy movie's in the last decade. Such an incredible thrill ride, that is a top blockbuster that is definitely the best of this specifc action franchaise, and in fact, I go this far to say - it's direction, stunts, action sequences, plot, it's star - make it one of the greatest action movies of all-time. Now setting the bar higher than Hollywood has ever seen, this one is like nothing you've enjoyed in action films. 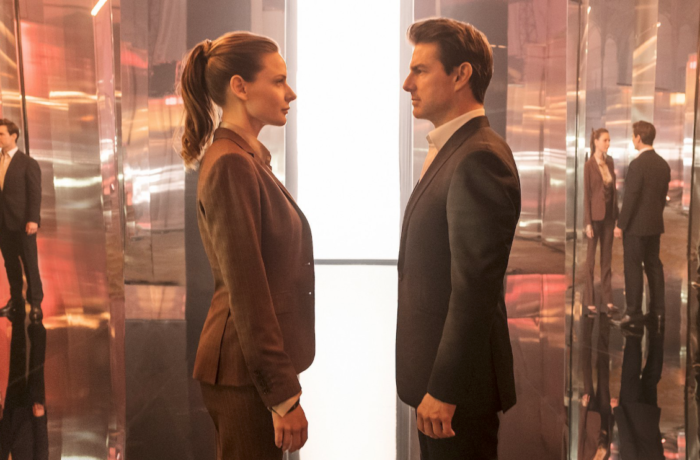 Ethan Hunt (Tom Cruise) and his IMF team (Alex Baldwin, Simon Pegg, Ving Rhames) along with the girls (that look so much alike, it's hard to tell them apart, Rebacca Ferguson, Michelle Monaghan) are in a race against time. Henry Cavill, Angela Bassett, and Vanessa Kirby add gravitas for the first time, as they are now added into the lineup. Angela Bassett has a small role but she brings weight to any movie she is in that we truly need to see more of her in any film. She was the original Viola Davis and has not been getting the parts nor accolades she deserves so hopefully this sheds light on her again. The plot is as usual, complicated with many the twists and turns. Ethan Hunt (Cruise) and his team must track down stolen plutonium while a CIA ageint joins along but a big twist takes place (you can figure it out) that it makes the entire mission go haywire. It begins with what's left of the The Syndicate organization that has now turned into a terrorist group called The Apostles. Hunt gets his mission to intercept the sale of three plutonium cores (a mission he chose to accept) but when he saves the life of his partner Luther, rather than save the plutonium, which is going to be used to build three portable nuclear weapons - that he now has bigger fish to fry. That's when everything goes up in smoke and vulnerable Hunt MUST stop the world from being blown up. With a running time of 147 minutes, some say it's too long. I say, not so. I could have used another 20! The action sets in the moment you sit down and does not let up until the very last scene. Tom Cruise is just amazing. Yes, I just said that. There is no other word; his stunts, his running, and yes his acting, take this to an entirely new level. Not an actors actor, but in these films, there is no one better on planet earth than Tom Cruise. This time the stunts are a plenty, one after another, after another, and they are long and enjoyable ride-along sequences. Far reaching and implausible stunts, but visually riveting that you are left gasping and appluading in your head (the final scene has your jaw actually drop.) The cinematogrpahy continuosly - a shear 10 out of 10. This time, Tom and his stunts are the star of the movie, along with strong performances from every other character. Each one brings a little something. The franchise is the best out there today and will go on until Cruise says it won't and or his joints give out. With McQuarrie directing the second one now, you can be sure, he is in for the long haul. This series does an odd thing, in that it keeps getting better. The first three were OK, but after that they experienced real liftoff. It leaves you wondering - how can they top this for seven? Filming took place from April 2017 to March 2018, in Paris, United Kingdom, New Zealand, Norway and United Arab Emirates. Each countires scenes are spectacular and as the first series to be released in REALD 3D (also IMAX) this one makes the moviegoing experience as good as it gets for Summer 2018.